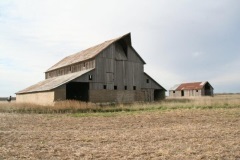 Shortly after the Kansas territory was opened to settlement in 1854, William and Jane Shaft moved their family from Michigan to a 160-acre farmstead northeast of present-day Clements. 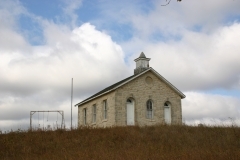 In 1857, Shaft and his sons erected a small stone house using locally quarried stone. Less than six months after arriving, William died while attempting to cross Diamond Creek at Harris Crossing. The family persuaded a reluctant Jane to remain in Kansas. 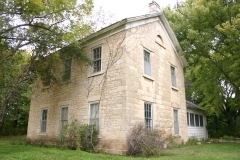 Her sons erected a large two-story limestone addition on the south side of the house in 1868, and her name was inscribed in the dressed stone within the east-facing gable. As with other mid-19th century vernacular stone houses, the Shaft house was built in phases with the addition of a wing sited perpendicular to the pre-existing side-gabled building. Differences in the stonework clearly delineate a phased construction, and it reflects the work of the builders who responded to the locally available building materials. 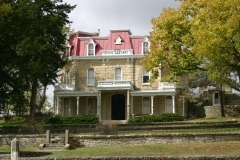 The house was nominated for its association with early settlement history and its architecture. 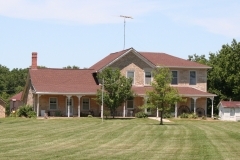 The Spring Hill Farm and Stock Ranch is a late 19th century enclosed cattle ranch and headquarters that outstandingly represents the transition from the open range to the enclosed holdings of the large cattle companies in the 1880s. This facet of the national theme of the cattlemen's empire is not represented by any other property in this part of the southern plains. 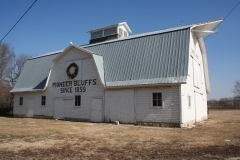 The enclosure and consolidation of ranches during the late 19th century was accompanied by the improvement of range cattle through purebred breeding programs and, in the Flint Hills region, a distinctive practice of fattening southwestern cattle on the bluestem pastures during the summer before shipping them to market in the fall. 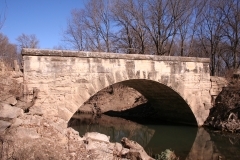 The period of significance extends from the first purchases of ranch land by Stephen Jones in 1878 and extends through 1904, when the ranch lands began to be sold off by Bernard "Barney" Lantry's sons. The Strong City Opera House was built in 1900 and 1901 for the Strong City Musical and Literary Association from plans prepared by architect John Frew. Construction funds of $6,000 were raised by the sale of shares at $10 each. Local stonemason J.P. Norton was the general contractor and Rettiger Brothers had the subcontract for the stonework. The grand opening was held April 19, 1901, with the entertainment provided by the Modoc Club and Marshall's Band from Topeka. 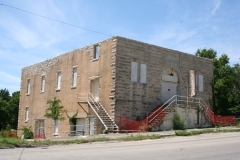 The building was acquired by the city for use as a community building in 1921 and frequently leased for use as a movie theater. 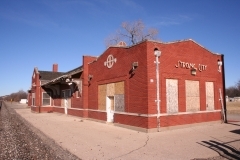 The city sold the property in 1985 and since then it has been vacant and deteriorating. 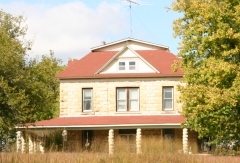 The city reacquired the property in 2000.